Unite The Right: Are Alt-Right Groups Growing Splintered? "How [do] they want to represent themselves?" one expert asked. "Is it with Nazi-like symbolism or imagery or is it in polo shirts and khakis ... that could be more palatable to the American public?" One early consensus is that the movement is still going strong, with active recruitment online and at rallies. However, it appears factions have splintered in the past year. Hundreds of white men rallied in Charlottesville last year, many openly displaying neo-Nazi and white supremacist symbols. Today, some of those men are in legal trouble, including the founder of the "Unite the Right" rally, Jason Kessler. Others were reported to have been ostracized when they returned home to their communities. In an interview with Noel King of NPR's Morning Edition before the weekend rally, Kessler distanced himself from white supremacists, white nationalists and those who attended his 2017 march displaying neo-Nazi symbols. "I'm not a white supremacist," he said, "I'm not even a white nationalist. I consider myself a civil and human rights advocate focusing on the underrepresented Caucasian demographic." But Kessler has made statements that align with white supremacy. Later in the interview, Kessler said he believes there are differences between the races in including physical differences as well as "differences in behavior and levels of aggression and intelligence, in bone density, etc. etc." Kessler also defended his right to hold marches like last year's in Charlottesville and another he has planned for this weekend in Washington, D.C.. "The First Amendment is under attack," he said, "if not legally, in practice. ... Legally, I have the right. It's not that the police are trying to oppress me or that the government is trying to oppress me. Who's trying to oppress the rights of white folks who are standing up for themselves are Antifa who come there to use violence to shut down speech." 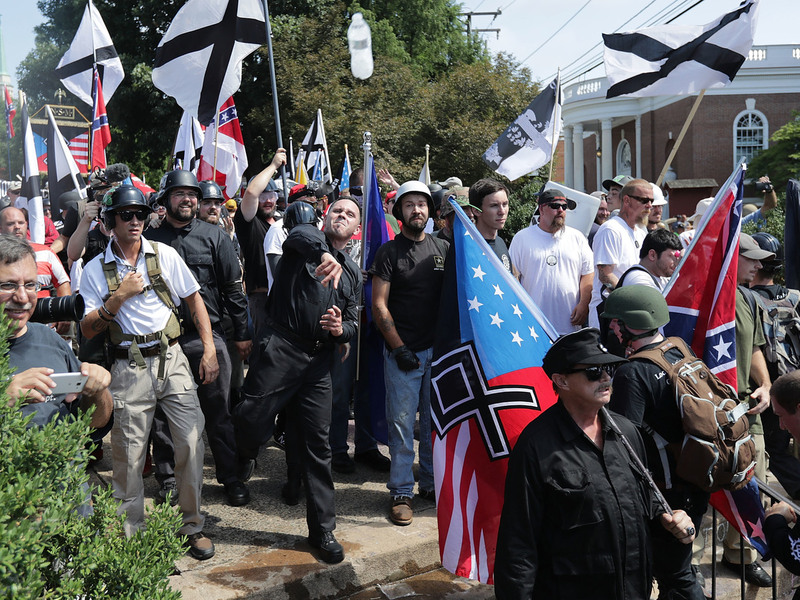 George Selim of the Anti-Defamation League's Center on Extremism says one year on, there are also divisions online among extremist groups over whether they should hide most of that racist imagery during public appearances and look more mainstream. That is a tactic, he says, designed to make their extremist ideology seem more acceptable to the mainstream. You know, how [do] they want to represent themselves? Is it with Nazi like symbolism or imagery or is it in polo shirts and khakis that's ensconced in kind of white supremacist ideology that could be more palatable to the American public? "You know, how [do] they want to represent themselves?," he asked. "Is it with Nazi-like symbolism or imagery or is it in polo shirts and khakis that's ensconced in kind of white supremacist ideology that could be more palatable to the American public?" One of the biggest controversies thus far in the Trump presidency was after Charlottesville, when the president blamed "both sides" for the violence. Randy Blazak, who studies domestic terrorism at the University of Oregon, says the far right movement remains divided on Trump today. Some still support him and his 'America First' platform, while other, more anti-Semitic factions, are inspired by the anti-government beliefs of Timothy McVeigh, the Oklahoma City bomber. "They've used that rhetoric in social media [claiming] we need a Civil War and we have to be ready to throw our bodies into the fray to save America," Blazak says. After the deadly violence in Charlottesville, it appears far-right groups not closely tethered to white supremacy are having their moment. This is especially the case on the West Coast lately, where groups like the Proud Boys and Patriot Prayer have been staging rallies and protests in liberal cities and college campuses. The Proud Boys, self-proclaimed "western chauvinists," have distanced themselves from official "Unite the Right" style rallies and many members condemned the violence in Charlottesville. Patriot Prayer was founded by Joey Gibson, who ran unsuccessfully as a Republican in the U.S. Senate primary in Washington state. Both groups regularly appear together and claim they're promoting Free Speech rights. But they rarely seem to provide specifics about particular issues. Their protests and scuffles with counter protesters often end in violence and arrests. "One of the things I learned from Trump is that he knows how to troll the left [and] the media," Gibson told supporters at a rally in Portland earlier this month. Blazak, who also chairs the Oregon Coalition Against Hate Crime, says that during the Obama administration these types of groups were mostly online, acting as pranksters. After President Trump took office, he says, their trolling is in 3-D.
"They're not really a movement in the traditional sense that they have a cohesive political platform and an end game," Blazak says. "It's more about the agitation and creating the conflict that creates a space for them." Indeed, rallies that Gibson organizes can at times feel like a Twitter feed, or internet chat room, that's being acted out in real life, especially when the activists clash with counter protesters, like anti-fascists, both groups in costume. "Gibson is very charismatic," Blazak says. "He's a biracial person and can help broaden their message by playing that role of not being your grandfather's white supremacist movement." 3. Potential for a greater threat of violence? Even though organizers of the Unite the Right rally cancelled plans to hold an anniversary event in Charlottesville, Va., police and community leaders were concerned extremist neo-Nazi groups may show up anyway. The main event, organized by Jason Kessler, was moved to Washington D.C. As NPR reported over the weekend, there were about 25 participants in this year's Unite the Right rally as well as hundreds of counterdemonstrators and a heavy police presence near the White House. Kessler told Morning Edition before the rally that he wanted the event to be peaceful. "I have publicly stated numerous times I don't want neo-Nazis at my rally, and they're not welcome," he said. "I've been putting that out on Twitter. ... I'm getting attacked by the far left and the far right because I believe that extremism is not where we need to go right now." Some far-right activists see themselves as being on the frontline of a culture war over the future of the United States. Experts who have spent their careers monitoring these extremist groups say there is an increased concern for violence as the movement becomes more splintered, volatile and hard to predict. The ADL's Selim echoes that sentiment, saying the alt-right is still "a serious threat to our homeland security and something that we should be paying strong attention to."